The Hankyoreh, South Korea’s fourth largest newspaper, is the country's only non-corporate daily. Owned by workers and thousands of citizens, it's a unique experiment in radical media. In an exclusive essay, its executive editor, Taesun Kwon, charts a highly inspiring success story. 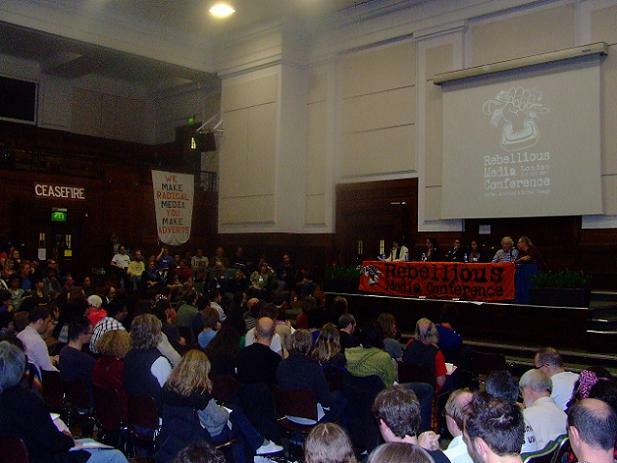 It was great honor for me to introduce the paper I work for, the Hankyoreh, to hundreds of renowned progressive media comrades at the Rebellious Media Conference two weeks ago. This honour was made distinctly more special when I shared the plenary session panel with, amongst others, distinguished scholar and activist Prof. Noam Chomsky. In this essay, I’d like to share with Ceasefire readers, the extraordinary story of the Hankyoreh. The circumstances of its birth and growth, however unique, nonetheless ought to give, I hope, some valuable insights for radical media makers around the world. When talking about news organisations, people often begin by discussing one person in particular. The history of Britain’s The Guardian is often explained through the figure of Charles Scott, that of Germany’s Der Spiegel through Rudolf Augstein, France’s Le Monde through Hubert Beuve-Mery. This is not the case with the Hankyoreh. In describing the history of this newspaper, I can’t begin by talking about any one person. It can neither begin nor end with the story of one particular leader, one manager, one reporter – not any one individual. Indeed, since its founding on May 15, 1988, the Hankyoreh has been created not just by its leaders, its managers, its reporters, but most of all by the public – by the South Korean masses. It is of course also a word that, in the West, might well be favoured by nationalist members of the right wing. In Korea, it has a different sense, to the extent that, interestingly enough, there are right-wingers in South Korea who think the name “Hankyoreh” carries left wing connotations. Contained within the word “Hankyoreh” is a spirit of criticism that challenges the “twisted modernity” that was formed over the course of the past century. Whereas, over the past century, Koreans have demanded democracy, liberty, and independence, there never existed a proper modern medium for modern Koreans demanding true modernity. South and North Korea were established in a land devastated by the Korean War, which began in 1950. Capitalism and communism were imposed on the two Koreas by the world’s major powers. Unsurprisingly, on a Korean Peninsula torn by ideological and military conflict, there was no free press. The South Korean industrial development that started in the 1960s represented another face of the South Korean military dictatorship. The three decades through to the early 1990s, featuring two military coups, saw a prolonged rule by military men. For years, the mainstream press stayed silent in the face of military and police abuses. As they endured this long period of oppression, the Korean people continued to believed that the solution to their predicament lay in the reunification of their single peoples, divided by empires. “Hankyoreh” is a word that expresses this dream. Before the name ‘Hankyoreh’ was chosen, various alternatives were considered. These included Sae Sinmun (meaning “New Daily”) and Dongnip Sinmun(meaning “The Independent”). The younger journalists, however, preferred “Hankyoreh,” and their wishes carried the day. It is foolish to classify the Hankyoreh as being either “left-wing” or “right-wing,” but it is not wrong to say that a critical stance toward twisted modernity is representative of all Hankyoreh’s journalists. In this regard, South Korea’s Hankyoreh newspaper bears no relation whatsoever to nationalist right-wing ideology. The core forces behind the newspaper’s creation were themselves victims of right wing nationalism. In 1975, around 150 journalists were dismissed by their management after resisting the military government. These journalists would later become the leadership of the Hankyoreh. In 1980, another 1,000 or so journalists were dismissed by their newspapers after fighting the military government. These journalists would later become the mid-level managers for the Hankyoreh. This is the group to which I belong. These individuals spent many years in the wilderness. No news organisation would take them. They were even forbidden to find employment with other companies. Under the military administration, they created underground newspapers and magazines. There was no money to be made from this, so they were all terribly destitute. However, what really broke through these dark ages of the South Korean press was not the small minority of journalists publishing underground newspapers but the citizens who took to the streets against massive oppression, including suppressions of the press. In June 1987, an enormous citizens’ revolution against the military government spread throughout the country. It was through this resistance, which rivalled the Jasmine Revolution unfolding in the Middle East today, that press freedoms were first guaranteed. Upon the foundation of this outlet, established by citizens, journalists came together in pursuit of a free press-the same journalists driven out by the military administration and newspaper management.They were not content with turning their underground newspapers into legal newspapers and printing more copies. Instead, they wanted to create a totally new medium that was independent from political power and business interests. They also wanted to create a new medium to stand against a mainstream press that had developed over the previous century under the aegis of political power and business interests. Of course, they needed money. They needed to pay for the rotary presses to print the newspaper, and they needed to pay at least minimal wages to the journalists. And yet, the Hankyoreh’s founders did not go begging for money from large companies or those people holding political power. Instead, they undertook a large-scale citizens’ campaign. Between December 1987 and February 1988, some 27 thousand citizens purchased stock in the new newspaper. The total investment was 5 billion won (5 millon dollars). A second citizen fundraising effort was launched in October 1988, just after the newspaper was founded. In the period through June 1989, around forty thousand citizens bought stock in the new newspaper, for a total investment of 12 billion won (12 million dollars). That initial 17 million dollars became the capital for the Hankyoreh, and the 67 thousand citizens who volunteered to buy stock became its small shareholders. Afterwards, the capital was gradually increased through similar methods. In the 2000s, employees purchased large amounts of stock. Today, around 65% of the Hankyoreh’s 32 billion won (32million dollars) in capital is owned by citizens, and around 35% is owned by 400 or so Hankyoreh employees. When you get the chance, try asking a Wall Street financier the following questions: is it possible to create a newspaper company that would be jointly owned by 60 thousand citizens? And if so, could such a company grow and develop continuously for more than two decades? It is, you will find, something impossible according to the logic they understand, the logic of financial capital. As such, South Korea’s citizens made the impossible a reality. Since its founding, the Hankyoreh has been an oasis, a refuge, for South Korean journalists. In May 1988, journalists who had been earning substantial paychecks at mainstream news outlets heard the news of the Hankyoreh’s founding and made their way there. Young people with dreams of a free press joined the Hankyoreh as junior reporting staff. Over eight thousand people applied for the exam to select around thirty reporters for the newspaper’s first year of operation. Journalists who are sick of pressures from shareholders, advertisers, managers, and politicians have been tendering their resignations and joining the Hankyoreh. Unsurprisingly, the Hankyoreh is the news organization that South Korea’s university students most want to work for. Since its founding, the Hankyoreh has been critical of nationalism; of conglomerate-centered market extremism; of South Korea’s National Security Act, which is comparable to the anti-terrorism laws in the US and UK; of war; and of state abuses. Since its founding, the Hankyoreh has strived to defend human rights, political democracy, economic equality and opportunity, social welfare, and press freedoms. It may sound strange, but most South Korean news organizations, which developed behind the shield of political and business powers, continue to this day to betray the modern values of democracy, liberty, and independence. Sure, the Hankyoreh does not have the largest circulation of newspaper in South Korea- it ranks fourth in that regard. But the first through third positions are occupied by conservative right-wing newspapers that were first launched under the aegis of Japanese imperialism, including a pro-market, right-wing newspaper created by that famous global enterprise, Samsung. And yet, ever since its foundation, the Hankyoreh has ranked first in trust and first in preference in innumerable opinion polls and consumer surveys. This does not make it the largest newspaper in South Korea, but it does make it, in a way, the most powerful. Underlying this power is the paper’s democratic approach to its own operation. The Hankyoreh is the only newspaper that is utterly free from political and business power and is democratic in its operations. For instance, since May 1988, it has selected its president and managing editor democratically through voting by journalists, employees, and shareholders. Once their three-year term is over, other candidates emerge and campaign for their positions. The candidates release materials evaluating the newspaper’s past and suggesting its future, and they engage in open debates before the newspaper’s employees. A candidate for president has to answer questions from younger journalists and, later, from citizen shareholders. As far as I am aware, no other newspaper in the world has this kind of utterly democratic operation. However, the Hankyoreh has recently faced a new challenge. The military government of the past tried to suppress it with brutality: sending police to the Hankyoreh’s editorial offices, arresting its journalists, and attempting to suspend its publication permit. Today, we are being suppressed by political and economic forces united in neoliberalist doctrine, working in the name of market liberalism. Samsung, South Korea’s largest company and the most important advertiser for many newspapers, has refused to print advertisements in the Hankyoreh for the past two years, claiming our paper’s articles interfere with its profits. This happened right after the Hankyoreh exposed the company’s anti-human rights actions, including infringements of labour rights and illegal abuses of management rights. The South Korean President- who had previously served as president for another global company, Hyundai- rewarded the three mainstream conservative newspapers for contributing greatly to bringing his administration into power by granting them permission to enter television broadcasting. As a result, the conservative networks are set to become South Korea’s version of Fox News, and thus to apply another kind of pressure on any well-meaning companies keen on advertising in the Hankyoreh. These market-centered suppressions have taken place primarily in the last five years. Surprisingly, the Hankyoreh made a profit every year during that period. Without artificial restructuring, we withstood the market pressures of hostile forces through management rationalization: cutting costs, improving the quality of our reporting, and increasing sales. Our Internet edition and weekly are ranked in a solid first place in the market of similar media. What we seek to preserve is not a “media corporation,” but the medium itself. The challenge we have met with is a conspiracy to trigger the collapse of the Hankyoreh as a media corporation and thereby cause the disappearance of a true press from South Korea. We will overcome through the power of collective wisdom., as has been the case since the newspaper’s founding, we are a multitude that is not reducible to any one individual. There is another real challenge the Hankyoreh faces, one that is very puzzling. South Korea is a nation transforming at the speed of light. Our Internet and mobile environment seems to change over the course of each passing day. An absolute majority of citizens access the Internet and communicate with mobile technology. Having previously adopted the printed newspaper, the weekly edition, and the Internet as its platforms, the Hankyoreh now stands before a “post-modern” wave. Of course, this challenge may well apply to all journalists who call themselves radical and independent. The Hankyoreh is not afraid of “post-modern” platforms. The Internet and mobile technology are themselves media of the multitude. South Korea’s multitude is constantly questioning and exploring the credibility of the limitless torrent of information they encounter. And their benchmark for trust is, once again, the Hankyoreh. According to very recent figures, we ranked first in terms of news reports that South Korea’s Twitter users recommend and send to fellow users. They carry the most state-of-the-art smartphones, but they still look to the Hankyoreh. We did not create the smartphone. We have no emblematic figureheads like Steve Jobs. What we have created instead is trust. We have ‘US’. We have a multitude that trusts us. This originated in distrust for a “twisted modernity” that built up over the course of a century. It originated in trust in the Hankyoreh as the emblem of a true press established over the past two decades. It was at this newspaper that I served as South Korea’s first female managing editor, and it is there that I now serve as South Korea’s first female executive editor. Still, I am but one name among the many behind the development of The Hankyoreh, a paper that will proudly continue to be a medium for the masses. Taesun Kwon is a founding member of The Hankyoreh, South Korea’s only non-corporate daily national newspaper (circulation over 500,000). She was South Korea's first female managing editor, and is now the paper's Executive Editor.